First Line: "How did we let ourselves get involved with this?" Cora Chevalier whispered to best friend and business partner, Jane Starr. Cora Chevalier isn't happy about being coerced into painting the backdrops for the latest production of the local theatre group, especially since she and best friend Jane Starr have their first-ever Crafty Moms' Escape Weekend coming up. The theater group always seems to be "one more thing" it wants the two women to do for them. 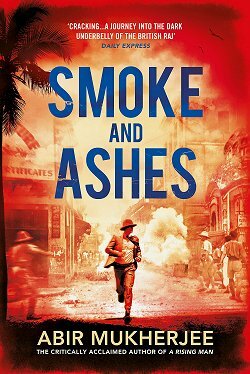 But when Stan Herald, the obnoxious director, is found dead and their friend Zee is arrested, Cora knows that there is one more thing she must do before the final curtain comes down: find the real killer. Author Mollie Cox Bryan has a knack for choosing and describing crafts that makes me want to head for the nearest store to buy up all the necessaries and start to work. 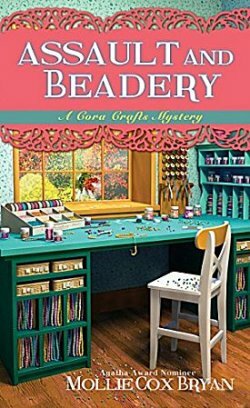 After reading Assault and Beadery, I now want to take up beading. 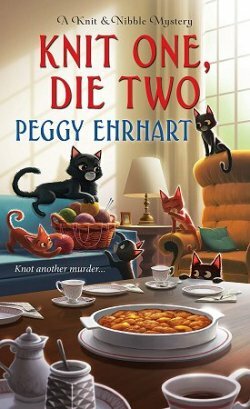 Aided by two characters from the author's Cumberland Creek cozy series, Cora and Jane have their work cut out for them in a very well-plotted mystery that will keep readers guessing. There are so many people with so many secrets and hidden pasts and agendas that Cora wonders if she should also run background checks on all the people attending their retreats as well as the teachers-- but she's not really serious. However, that passing thought does highlight one of the things I like about this series: Bryan lets readers see the business side of running a small craft retreat. Like any cozy series worth its salt, the cast of characters is first-rate. Cora Chevalier spent many years running a shelter for the victims of abuse. She's seen more of the dark side of human nature than most people have, and she made the conscious decision to leave that life and do something that would not only help people but bring herself joy. But she cannot deny the very basic part of her nature that wants to help those in need. It's not an accident that her last name is Chevalier, which is French for "knight". Her empathy, her compassion, has made her a knight in shining armor for people in trouble. To leaven Cora's nature, there are two other characters. Victim of domestic abuse and mother of a small daughter, Jane Starr is the very practical and logical one in the business and friendship. Her life has taught her to be cautious, and this is something that Cora needs during her murder investigations. The third character is the older woman, Ruby, whose son is a lawyer who's proven invaluable in these cases. Ruby is a local and a hard worker, but she's a gossipmonger and is a bit too abrasive for me to like her much-- but who says we have to like everyone? 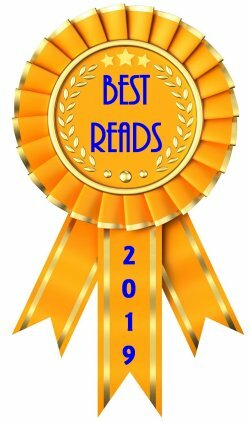 Good setting, good crafts, good mysteries, good characters. That's what you get in Mollie Cox Bryan's Cora Crafts series. Give it a try! Thanks so much for the thoughtful and kind review! 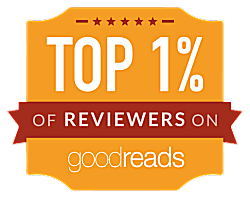 You're very welcome-- Keep on writing these books that we all enjoy reading! This does sound like a good read, Cathy. I'm not a person who does a lot in terms of crafts, though I used to crochet. So it's always nice to see a mystery from the point of view of someone who is skilled that way. Glad you liked this. I come from a long line of farm women who seemed to believe deep down in their bones that idle hands are the devil's workshop. I have beautiful handmade items from a few generations that leave me in awe.